Welcome bags for your out-of-town guests are a great way to show your appreciation. It shows that you care about their well being while they are away from home and gives you a chance to communicate the weekend’s events. 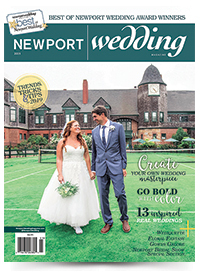 Tip: Be sure to add local publications and visitor guides to help guests feel more connected to the place you choose to say your vows, along with a few local treats to give them a taste of Newport.